STILLWATER — Strengthening Oklahoma’s workforce pipeline through degree and certificate completion continues to be the state system of higher education’s top priority. 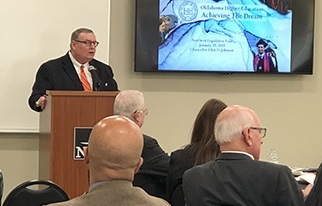 That was the message delivered by Chancellor Glen D. Johnson as he presented the Oklahoma State Regents for Higher Education’s FY 2020 budget request and 2019 legislative agenda to an audience of lawmakers, community leaders and educators at NOC Stillwater on Friday, Jan. 25. “As we continue our work to build Oklahoma’s economy and workforce by increasing college degree completion, we must focus on increasing faculty salaries, restoring base operational funding and fully funding the concurrent enrollment program for high school seniors,” said Chancellor Glen D. Johnson. “Low salary levels are straining public college and university faculty retention and recruitment in nursing, business, education, sciences, engineering and other high-demand programs that are essential to meet Oklahoma’s workforce needs,” he said. The Oklahoma State Regents for Higher Education recently voted to request $878.2 million for FY 2020, which reflects an increase of $101.5 million or 13.1 percent over the FY 2019 appropriation of $776.7 million. The State Regents are requesting $38.7 million to provide a 7.5 percent increase in faculty salaries. The average faculty salary at Oklahoma’s public colleges and universities is more than 10 percent below their peers in other states. The request also includes $20.4 million to increase the number of faculty and instructor positions and restore course sections to meet academic instruction requirements. Increased funding for financial aid and scholarship programs will also be a priority; the State Regents are seeking $12.3 million to restore significantly diminished scholarship programs and fully fund the concurrent enrollment program. The State Regents will also continue efforts to protect the dedicated funding source for the Oklahoma’s Promise scholarship program, through which more than 80,000 students have earned college tuition scholarships since the program’s inception in 1992. Another area of legislative focus for the state system of higher education will be to maintain current law regarding weapons on campuses. Oklahoma higher education supports the second amendment and gun ownership. Under current law, campus presidents have the discretion to permit the carrying of weapons when an exception is warranted. The State Regents and the presidents of all 25 state system institutions strongly believe that the current law with regard to weapons on campus is working.